With the new mobile technologies, apps and services available now, and more soon to come, Mobile Shopping from in-store is the new trend and we can expect from it a new interesting, interactive, personalised experience as a consumer in our favourite stores. New industry standards are being created, new mobile apps are being developed, new mobile commerce offerings are being launched and you will soon be experiencing it yourself. In-store mobile shoppers, will be able, on their smart phone, to scan a product or take its picture, to see products advertizing, videos, compare products, compare prices in competitive stores, find technical specifications, or ingredients for food, read consumers product reviews, retrieve discount coupons online, receive directly on their phone promotions and coupons based on their purchase history in the store, get loyalty points from the store and much more. There will be real benefits for the retailers and stores too, by providing more information, better service, improved customer satisfaction, by attracting more customers in their stores and converting them into buyers, and improving customer loyalty, they will increase their sales. 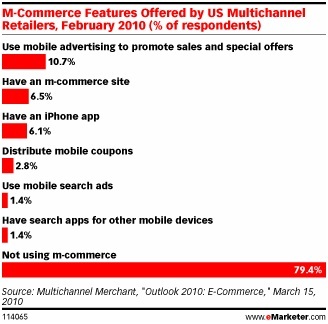 The charts attached show that Mobile-Commerce & Mobile-shopping are still at the early adoption stage, but you can be sure this will grow quickly and explode sooner than later, as this will be a way for major brands and retailers to differentiate themselves, gain competitive advantage, improve customer experience, retain or gain new customers, and increase their market share. 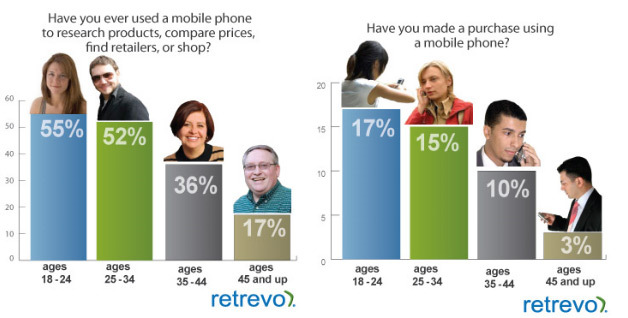 Mobile-Commerce and In-store Mobile shopping will change our shopping experience and the way we buy. Yes, good example of a great way to leverage mobile phones for M-commerce and this worked very well for this fund raising for Haiti recovery. And it was simply done via SMS. However Mobile-Shopping is still at its early stage and it will also transform our shopping experience from choosing, comparing, deciding, buying and paying for products inside the store, all that through the phone. we shop � � Marcomnext’s Blog by Gerard Dusastre. I actually do have a couple of questions for you if you don’t mind. by brain dead visitors? 😛 And, if you are writing on additional sites, I would like to keep up with you. wonderful issues altogether, you simply received a emblem new reader. Thank you a lot for sharing this with all folks you actually recognize what you are speaking approximately!